They can be all sorts of places - woodlands, wetlands, meadows or coastal sand dunes. They provide wild spaces where plants and animals, both common and rare, can thrive. They offer a more natural environment than parks and gardens, but are still readily accessible to, and for a wide range of people. Easter Inch Moss and Seafield Law Local Nature Reserve is an area of locally important natural heritage, managed by West Lothian Council in partnership with a Local Management Group. It was designated a Local Nature Reserve (LNR) in 2007. The reserve gives people the chance to learn about and enjoy nature close to where they live as well as being a valuable green space to be enjoyed between two built up areas (Blackburn and Seafield). As well as being a valuable green space for local residents, the moss is also home to over 140 different plant species, with 11 being recognised as rare in West Lothian. The moss is home to a wide array of bird life, insects and mammals in the open areas of the moss, with toads and newts found in the damp wet areas. However, like many peat bogs in the UK, Easter Inch Moss has been badly damaged by poor management over the years but is recognised as an important area for wildlife which should be protected for generations to come. Although it is already a refuge for wildlife, Easter Inch Moss has the potential to return to its former glory as a lowland peat bog offering a diverse matrix of niche habitats for peatland flora and fauna. In 2015 a project was funded through the SNH Peatland Restoration Fund to begin the process of restoring Easter Inch Moss back to its 'natural' state. Volunteers removed large amounts of encroaching scrub and helped with damming ditches using either plastic piling or scrub material. A wet bog is a healthy bog, so this work will hopefully help to retain water within the site creating a perfect environment for important peatland species to thrive. The long-term management aim is to convert the Moss back into a healthy, well-functioning bog that will absorb and store carbon, helping reduce climate change for generations to come as well as continuing to provide an important haven for wildlife and open space for people to access and enjoy. The Easter Inch Moss & Seafield Law Local Nature Reserve Habitat Management Plan (HMP) was last revised in 2011. The council has updated the HMP in 2016 in discussion with the Local Nature Reserve Local Management Group and it will act as the basis of decisions on management actions over the next 5 year period (2017-2021). About 18% of the world's peatlands are found in Scotland and are thought to hold over 3000 million tons of carbon. Unfortunately, Scotland has already lost approximately 80% of its peatlands through land reclamation, forestry, farming and peat extraction and many of those remaining are under threat. A healthy peat bog absorbs and stores carbon over time but an unhealthy, dry bog releases carbon, adding to carbon dioxide in the atmosphere and contributing greatly to climate change. At present it is thought that Scotland's unhealthy bogs are releasing approximately 10 million tons of carbon back into the atmosphere every year. If we can restore Scotland's bogs and make them healthy again, they will stop releasing this carbon and will instead store it. Peat can also help prevent flooding as it acts like a giant sponge. It soaks up and stores rainwater coming from the surrounding area, allowing it to be slowly released into the surrounding waterways This also helps to reduce the impacts of flooding further down the valley, as the moss helps reduce the force and speed of the water which in turn reduces the amount of erosion. Harperrig ReservoirHarperrig Reservoir lies to the north of the Pentland Hills within the boundary of the Pentland Hills Regional Park. It is owned by City of Edinburgh Council and managed as part of the Water of Leith flood prevention scheme. Around the reservoir is intensively grazed neutral grassland, along with large areas of marshy grassland. 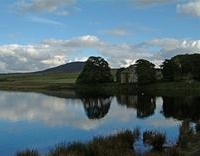 It is proposed to designate Harperrig Reservoir as West Lothian's second local nature reserve in 2011/12. This formal legal process is underway. Find out more from the Harperrig local nature reserve management plan [3Mb] 2009-14 (adopted December 2009). The council has updated the Harperrig Reservoir Habitat Management Plan that ran until 2014 and was approved by the council's Environment Policy & Development Panel Spring 2017.